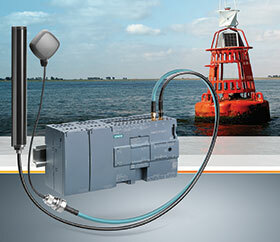 Siemens has expanded the possible uses for its telecontrol units from the Simatic RTU3000C product family, with new hardware and software. The new Simatic RTU has integrated GPS functionality for comparing the setpoint with the actual position. That makes it suitable not only for static applications such as the monitoring of distributed measuring points in the water industry, but also for mobile applications that require localisation functions. This includes, for example, position monitoring for floating navigation signs or container tracking. In addition, Siemens is introducing an extension board that allows users to connect up to eight additional sensors to the units. New firmware for the product family also offers users new functions, such as connection to redundant control centres and new function blocks for the statistical evaluation of process values. The compact and robust new telecontrol products are specially designed for energy-autonomous operation in environments without a power supply system and optimised for low-power operation. They can be supplied with power redundancy, for example with up to six battery modules or rechargeable battery with solar panel. They can also be used under harsh ambient conditions such as temperatures from -40 to 70°C or in flooding (with external IP68 protective enclosure). With the Simatic RTU3031C, Siemens is expanding this product family with an RTU that can be connected to a GPS antenna and that provides localisation and time synchronisation functions via the GPS signal. Users can thus monitor process data such as fill level, level and flow as well as pressure and temperature at remote and even mobile measuring points. The RTU3031C features an integrated UMTS modem, with which the collected data is sent to a control centre in a time or event-oriented manner. Like all telecontrol units in the RTU3000C product family, the new device not only supports connection to a control centre with telecontrol protocols (IEC 60870, DNP3, Sinaut ST7, and TeleControl Basic), but also use as a data-logger. In addition, all measured process values can be stored in internal memory or on an SD card and, if required, read out remotely via web-based management or sent to defined partners via secure file transfer or email. Integrated inputs and outputs allow the sensors to be connected directly. The new extension board for the RTU3000C product family enables the connection of eight additional sensors via Modbus RTU. It can be used with all variants in the product family, such as with the Sitrans FM MAG8000 for flow measurements. This benefits users from a wide range of different industries who want to take advantage of additional information from the sensors (e.g. diagnostic information). The new V3 firmware provides numerous improvements, such as connection to control centres with redundant IEC 60870 masters, extensions in web-based management and user administration, WAN connection via DNP3, and IEC 60870 without OpenVPN to operate the RTU3030C or RTU3031C over connections that are already encrypted by mobile telephony providers. Additionally, users have access to new function blocks for statistical functions, pulse train output for precise control of periodic signals, and module operating state management (e.g. safe shutdown, restart, etc.). This also allows faster connection establishment for encrypted connections.